Why should I use Superstar Phones ? Live the lifestyle you deserve with pure peace of mind. We have got you covered with the ultimate supreme 5 star service promise and we deliver it in style. ★ Telephone Technical Support – Absolutely any questions you have about your device we will immediately help to find the solution. ★ Fast Track Repair – We will fast track your phone for repair. 1-3 days turn around. ★ Exclusive Superstar Membership for all of our customers which include many fantastic benefits. How long does it take to customise my phone ? Customisations vary and generally it takes between 14-21days. We will fit the new customised housing onto your phone as soon as it has been made. (So you won’t be left without a phone). If you have chosen to purchase a new phone it will tend to be delivered between 14-21 days. How can I customise my iPhone? You can do this by going to the ”Customise” section and filling out the form or Alternatively you can give us a ring and we can get a digital design sent to you. Do I need to back up my iPhone before it is customised? There is no need to back up your device. Can I customise with my name or chosen logo ? Yes, You can customise your phone anyway you want. Customise options include exotic leathers, precious metals, crystal or even diamonds.  Anything is possible with Superstar Phones. Are your products real Gold ? Yes, All of our products are 24Kt Gold Plated. Do you ship your products abroad ? Yes, we are able to ship any product anywhere in the world. What warranty do I get ? If you have purchased a phone through us you get a 1 year warranty. Are the phones unlocked to any network? Yes, All of our phones are Unlocked and can work on any network worldwide. Do you gold plate any other products? Yes, We don’t just gold do plated Phones we can gold plate all kinds of devices from iPad, Macbook to Prestige Cars. We also specialise in 18Kt Rose Gold and 950 Platinum. For all customisations and products we require a 50% down payment to secure order and 50% on completion. We accept all major credit and debit cards and you can pay on our website or you can pay over the phone. Our team is here to help create the world’s most luxurious and custom Iphones and accessoiries tailor made to your wishes. Contact us to create your custom product.